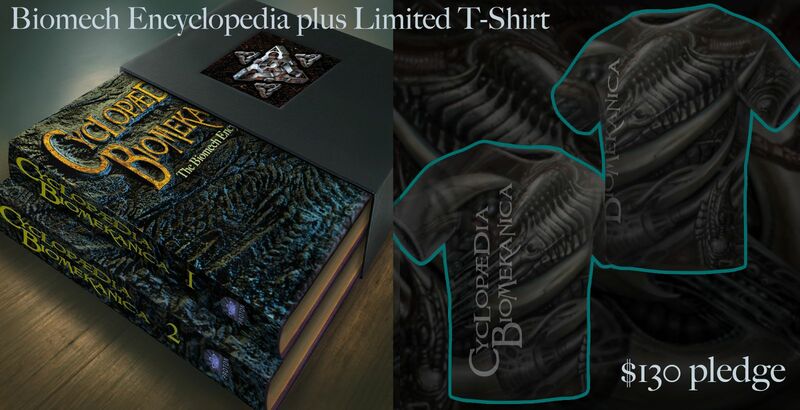 New Rewards Added to Biomech Encyclopedia Kickstarter Campaign! Happy New Year from Hyperspace Studios! The big news this week is our ongoing Kickstarter campaign, which is intended to fund the upcoming epic community book project, The Biomech Encyclopedia. The campaign is going well, and at this point it looks like we will at bare minimum reach our $40,000 goal, which will cover the cost of a deluxe 10x13” hardcover edition with a few extra bells and whistles. But we don’t want to settle for that if we don’t have to- ultimately, we’d like to raise enough to print the two volume edition with slipcase, as pictured here. That would allow us to include more content and to make the book more deluxe in general. If you are already a supporter of this project, take a look at our newest rewards. For those who have pre-ordered the book, you can now upgrade your pledge to include both the book and T-shirt. In addition, for those who have pledged at a higher level, you can now upgrade your pledge to include circular framed oil paintings by Guy, who is slamming away full time right now on the book content and reward packages. Let your friends know about the Biomech Encyclopedia Kickstarter campaign- this is a book that will be an epic visual trip for any art fan and an incomparable learning experience for tattooists, filmmakers, special effects artists, game designers, and graphic artists of all types who are wanting to expand their vocabulary. Once we break the $40K goal we’ll be announcing new rewards for stretch goals, some which will only be available to our early supporters. Help support the Biomech Encyclopedia project today!